Previously: Nikki can’t be part of the draft. Rusev and Lana are doing a Bulgarian wedding. So, now they do a Previously on Total Divas and Tonight on? Get it together already. We begin at the Teen Choice Awards, which John Cena hosted. Nikki Bella gets asked about not being drafted by some plant. “It definitely hurt.” And that’s the scene. 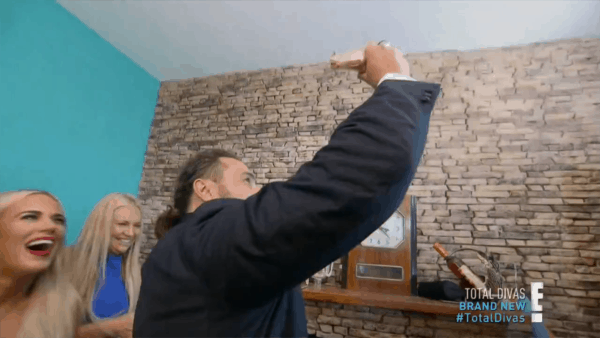 Now, we’re in Bulgaria with Rusev and Lana for their second wedding. Lana is super excited until she talks to Rusev, who says there is no maid of honor. Just a best man and a best woman, who are married to each other. That’s the scene. Now, we’re in California with Eva Marie. Flashbacks of Eva hugging her dad a lot. 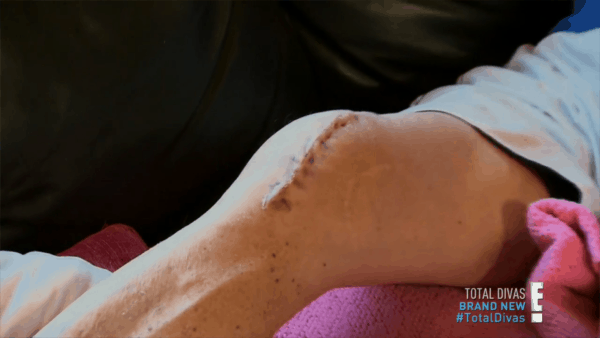 Her dad just had knee replacement surgery. Then, of course, we get to see the gnarly scare. (You know what that means, you get to see it too.) He’s pissed that Eva didn’t bring him McDonald’s. I hear ya, dude. After that, Eva wants to talk about retirement. That’s the scene. So far: Three scenes in three minutes. This is not an exaggeration. This is how this show is paced every week. I swear, this show will be the death of me. Lana and Rusev discuss the maid of honor thing again. Lana wants her sister as her maid of honor. Rusev explains Bulgarian rules to her again. This does not sit well with Lana. “He’s not hearing me.” Oh, great. Lana is going to be unbearable all episode before realizing that Rusev is right. It’s a Bulgarian wedding, they should do things in Bulgarian tradition. She’ll apologize and everything will be fine. You know what, I’ll make a deal with the editor. I’m not recapping a single second of this storyline until the conclusion. If I’m right, I’ll let you know. If I’m wrong, I will go back and recap every single little detail. So, if you don’t see Lana or Rusev mentioned again until the end, that’s a spoiler alert. The Bella’s do a photo shoot. Guess we’re just skipping over the Teen Choice Awards. You know, with Cena hosting, the Bella’s presenting, and the Bella’s being nominated for something. Glad we wasted that first segment on nothing. The important detail here is that Nikki got a call to be on Dancing With The Stars. Since this show is nine months behind, we know how this turns out. Eva’s dad is eating unhealthy. This does not sit well with Eva. How come none of these women are ever happy with anything? Eva decides that she’s going to throw out all of the leftovers. Five bucks says that Eva realizes she’s being overbearing and everything ends fine. Nikki has brunch with her Bella family. She says that she has to choose between wrestling and DWTS. Nikki says that WWE hasn’t called her. “Maybe you’re just not needed anymore,” says Brie. I refuse to believe that Nikki had no communication with WWE during this time. Her boyfriend is John Cena. He knows all. And if he doesn’t know, he’s powerful enough to find out. Eva supplies her dad with healthy food. She juices him up a green smoothie. Unsurprisingly, he hates it. Eva’s brother shows up and hates it as well. No one on this show likes anything, which is fitting because I don’t like this show. Eva goes snooping around the house for cigarette’s. She finds one outside. How does she know that it belongs to him? Eva and Jonathan (that’s Eva’s husband for those that don’t know) are now walking the dogs. Jonathan is wearing a shirt with Eva airbrushed on it. That’s creepy. He tells Eva to loosen up. Nikki talks to Cena about DWTS. Cena tells her that she can’t do both. Not with that attitude. Eva talks with her dad. He’s happy that Eva came to visit. She’s worried about him. He says he’ll be fine. Eva realizes she must loosen the reigns. So, nothing ever came from the cigarette thing? Glad we wasted a minute on that scene. Nikki calls her agent to talk about DWTS. He needs an answer about whether she wants to do it or not. She decides to pass. You don’t say. “My comeback needs to be in the ring.” Her agent respects her decision. In a complete swerve, Lana accepts the Bulgarian traditions. Natalya helped her realize she was being dumb. The wedding happened. This was the best episode of Total Divas ever. I didn’t have to recap half of it and I won five bucks. Lana is christened at a Greek Orthodox church. Her face is bathed in water. They also cut a piece of her hair, to signify surrender. Lana was not happy about this at all. Nattie, Naomi & Jimmy Uso arrive for the wedding. Nattie doing a traditional Bulgarian dance at Rehearsal Dinner. Lana and Rusev argue again about traditions. Lana shouts this in anger. Nattie explains to Lana that sometimes you gotta let go. Just be happy and accept the traditions. Bulgarian Tradition: Bride hides her shoes. Groom must pay money to get it back. Rusev finds shoe, after paying money. Now Lana can walk away and get married. Lana apologizes to Rusev. They make-up. All is resolved. Aww, there’s your happy ending, as Jeremy predicted.